I was alone at my favorite restaurant today and the waitress had just set my meal down in front of me. I started to eat and all of a sudden, memories rushed into my head; memories so powerful that the tears threatened to come. Hurry up and eat and you can cry in the car. And I cried all the way home. As I was driving home, I realized that the second I got home, I needed to finally write about this. I promised myself that much at least. It's been a little over 9 months since my dog, Molly, died. And while I've wanted to write about it, I haven't. I'm not exactly sure what makes today different. Maybe because I promised myself I would. Maybe it is because I have this nagging little voice in my head that is telling me that it has to be written today because soon, someone else is going to need this story....a story that I wish I could have read 9, 10, or 15 months ago. 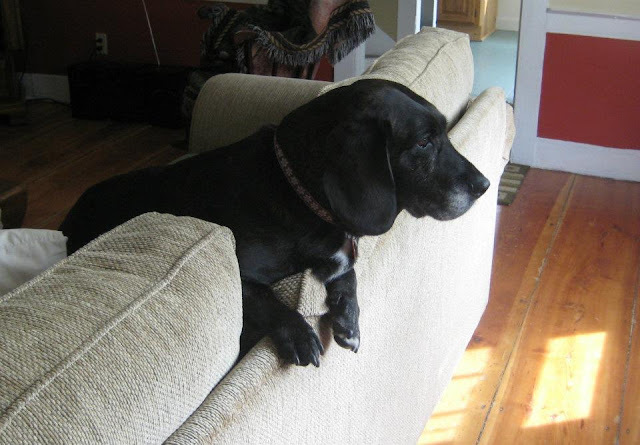 Molly was my almost 16 year old basset hound/black lab mix rescue. She was my constant, faithful companion for 13 of those years. She was more than a dog to me; she was my child. I couldn't imagine a life without her. But this story isn't about her life. It is about her death and the process of having to make the decision to end her life. I had noticed one day in the Fall of 2016 that Molly's breathing seemed labored. In addition, she was more fatigued than usual. Our vet couldn't see her that day and recommended we take her to the E.R. After many stressful hours, she was diagnosed with probable heart failure. For me, that was the beginning of the end. My husband and I talked and decided to proceed with medication to manage her heart failure. At this point in her life, at 15 years old, she had slowed down considerably and had some hearing loss. To be honest, I had been mentally preparing myself for years that her advancing age meant we would soon have to make some difficult decisions. We started with two medications and then took her to see a veterinary cardiologist. She said that yes, she had heart failure and when I asked, said that she thought Molly would probably be able to be managed on medications for roughly 2 years. We left there with several more medications and in addition to medications she was already on for arthritis and a thyroid problem, her list totaled 8 different medications. Molly actually improved for several months but then her breathing got worse again. The cardiologist told us her echocardiogram showed worsening of the heart failure. Medication doses were increased. At this time we also started to notice some changes in her behavior that indicated she may have dementia. And, her hearing was getting worse. I had a conversation with our regular vet about when we would know that it was "time." She talked about how many people make the decision to euthanize when the dog stops eating, appears to be in a lot of pain, or isn't enjoying life anymore. 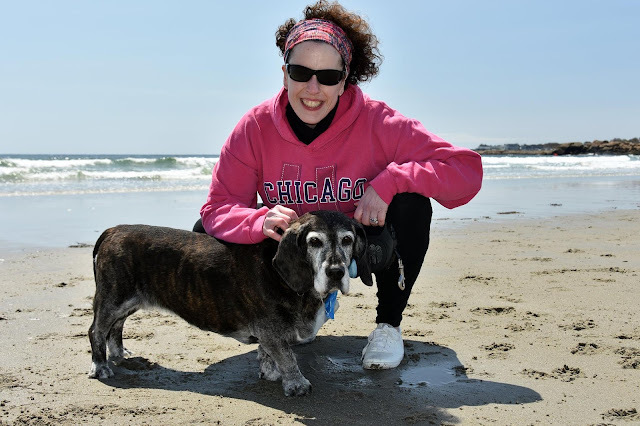 Molly didn't seem to be in pain; she was on a pain medication for years for arthritis. She was eating, although not as much as she used to. However it was becoming obvious that she was starting to struggle. The dementia was getting worse. Her breathing, at times, was getting worse, and her quality of life was worsening. I remember one afternoon, a few weeks before she died, I was lying down on the couch, on my back. Molly was always an affectionate snuggler but she did something new that afternoon. She got up from her spot by my feet, climbed up on my belly and chest, and rested her head so that we were practically nose to nose. She looked me right in the eye. It was spooky. I can't really explain how I knew. I knew she was telling me she was ready to go. So why did it take us several more weeks (2? 3?) then to euthanize her? I think there were many reasons. I was waiting for my husband to say, "it's time." (this is something we only discussed very recently...about how I knew before he did that it was time). He would point out that she still enjoyed being outside sometimes or that she was still eating. At times her breathing wasn't as bad. I was waiting for one of our two vets to say, "it may be time." Neither ever did. I was OK with euthanizing Molly. Well, as OK as anyone can be I suppose. The last thing in the world that I wanted was for her to suffer. But I was caught up in the thought of, "what if I am wrong...what if it is too soon?" I was afraid of murdering her. But I couldn't get rid of that nagging feeling from that day on the couch when she looked at me. And I was actually thinking about that as I walked into our house one day after about 2 hours of running errands. Something didn't smell right. I walked into our living room to find several small piles of stool. Not even diarrhea. Just regular stool and it seemed like she thought she was outside. She had been incontinent of urine on and off for many, many months, but the stool? That had only happened one time in all the years I had her and it was due to her getting into something outside when she was 4 years old and not being able to get outside to the bathroom in time. And that did it for me. I knew that she had to be really confused to do that inside the house. I could live with accidents in the house. Hell, I had been dealing with urine for a while. But it symbolized how much she was struggling, and likely suffering. Things were just going to get worse. I called my husband at work and told him we were putting her down. I called our regular vet and told them I wanted to make an appointment to have her euthanized. I was shaking so hard, I dropped the phone at one point. We chose a day the following week when neither one of us had to worry about going to work for a few days afterwards. Since we first found out she had heart failure, we were making the most of our time left with her. We got 7 months of appreciating every single moment with her. But after I made the appointment, I told my husband I wanted to take her to the beach one last time. Years ago that would have meant a full day trip with several hours of exploring. We had a glorious 30 minutes with her on that beach. She was almost like her old self again, until then she wasn't, and we decided it was time to go. Two days after that beach trip, it happened again. It was a Tuesday and she was scheduled to be euthanized on Friday. She was lying on my bed and I had been checking in on her a lot because it seemed like her breathing was more labored. The beach trip, which included 4 hours in the car, was probably too much for her but I was OK with that because she enjoyed it so much. I laid next to her on the bed and she turned to face me and it was there again...that look. The look that said I've had enough. I cried and stroked her head. I called my husband and told him I moved up the appointment to the next morning. He asked if I was sure because it was my birthday. I told him that I couldn't prolong her suffering just because it was my birthday. It was the right thing to do. Molly died on May 3, 2017. The events of that day are for another time, another blog entry. So what's the point in writing all this? Sure, it's a bit cathartic but God knows I've had plenty of people to process this with since last year. This is about more than that. It's about letting whomever reads this know that if you are in this same situation, the situation of choosing death over life, or mercy over suffering, or even compassion over selfishness, you can do this. Know that there is no "right" time. If you are taking the time to find your way to this particular post, I know you love your pet. And when you make this kind of decision out of love, you cannot be wrong. You are not giving up on your pet. And for God's sake, don't buy into the whole, "I'm murdering her/him" thing. You WILL NOT be wrong. Since last May, I have beaten myself up several times about if maybe we should have put Molly down sooner. Maybe we should have done it when she was first diagnosed with heart failure. That was actually some of the memories that revisited me today during my lunch. But then I stopped to think about my motives. Did we keep her alive all those months because we couldn't bear to let her go? No. It was a process of trying to give her a good life while managing a significant illness. What I will say to someone who is wondering when the right time is to euthanize a pet: listen to your gut. Don't overanalyze because it just makes the situation worse. Pay close attention to your pet. You know him or her better than anyone. If your pet gets sick with something that will eventually kill them (heart failure, liver disease, cancer, etc. ), make some tentative decisions about how far you are willing to go with their treatment. Think about the kind of life you want for your pet, and for you and your family. And lastly, don't let a vet, family member, or anyone else push you into decisions that in your gut, you know are not in the best interest of your pet. "We can do hard things." Thanks for posting this, Christine. We are facing this in the next year or so with our rescue Pekingese as he turned 13 last September. From what We've read, Pekingese don't make it to 15 so we are trying to make his days as enjoyable now as we can. The vet says he has a heart murmur so who knows? Many years ago, we had a dachshund that was 13 and he was always full of energy and suddenly we noticed that he couldn't make it up the step between our family room and garage. We immediately took him to the vet and learned that he had a huge abdominal mass that was pressing on his heart & lungs. It was a hard decision to make, but we also knew that we were not doing him a favor by extending his life any longer. It was hard on all 3 of us (my son had know him all his life as the dog was 6 years old when my son was born). The strange thing was that my grandmother had died the day before and I had not cried a tear, but I bawled my eyes out when we had to put Happy down. Our pets are certainly some of our best friends and it's only natural to feel their loss. 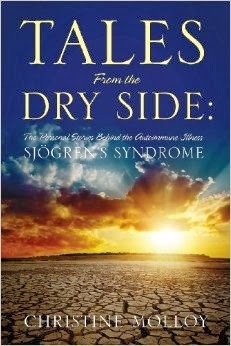 Welcome to Thoughts and Ramblings on Life, Love, and Health where I muse and write about a variety of topics pertaining to this crazy and awesome journey we call life, including my journey of living with an autoimmune illness called Sjögren's syndrome. Writing, especially when it comes from my heart, has become a passion for me. Thank you for sharing in that passion with me and taking the time to read. I strongly encourage commenting by my readers on this blog. Recently I have had to enable the comment moderation feature on the blog. If you comment and do not see it show up right away, do not worry. I get notified of all comments via e-mail and then I have to approve them before they are posted. I am not a doctor. Any medical information presented on this blog is based on my own experiences and is not intended to be used as medical advice.